King Cone (a seasonal business) started in Amherst, 33 years ago in the old Amherst IGA Store on Main Street, Amherst. In 1989 King Cone - Amherst moved to its present location on the corner of Wilson Street and Hwy. KK (formerly Old Hwy. 10). 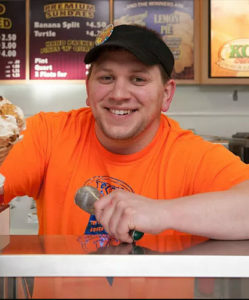 Through the years King Cone evolved into a full service ice cream shop serving both soft serve and hard serve ice cream. In 2011 we opened a second location in Plover at 2534 Post Road. When the second location was added we decided to take our ice cream to the next level and that's when we started to make our own ice cream. In 2016 we brought homemade hard serve ice cream back to Wisconsin Rapids with the opening of a third location at 1610 Baker Street. We joined the National Ice Cream Retailers Association in order to network with our peers for ideas and flavors. In 2012 we entered our Butter Pecan Kruncher ice cream in the annual contest and took home 1st Place in the Best Nut Flavor category. The category for 2013 was Best Candy Flavor and every year they have the Best New Flavor Category. Again we were fortunate enough to take home 1st Place in the Best Candy category with our Caramel Apple Sucker ice cream. We also took 2nd Place for the Best New Flavor with our Lemon Pie ice cream. In 2014 we took Honorable Mention with our Raspberry Lemonade flavor. This is a national organization, so we go up against ice cream makers from all over the United States. In 2015 we entered the World Dairy Expo Ice Cream Contest held in Madison, WI. Our Zanzee Chocolate Bar ice cream took 2nd Place in the World. In 2016 our Zanzee Chocolate Bar ice cream took 3rd Place in the World. We're very proud of the fact that our homemade ice cream can compete at a high level with much larger ice cream companies from around the country and the world.